Camping and traveling are fun and easy with the Highland Ridge Mesa Ridge Lite MR2802BH! This Travel Trailer is geared up and ready for the road! Here at Tradewinds RV Center, we offer incredibly low prices on all the most popular, top brand RVs! If you're driving by Clio, stop in at 4325 W Vienna Rd Clio Michigan 48420 and feel free to browse our huge inventory! Call us at 810-686-0710 today and our knowledgeable, friendly RV experts will be glad to help you learn all about this Travel Trailer and how you can own it at a price that will amaze you! You'll save $1000s! And we've got great financing, too! No matter where you live, our fast, reliable 24/7 delivery anywhere in North America, means your dream RV will be at your door in no time! 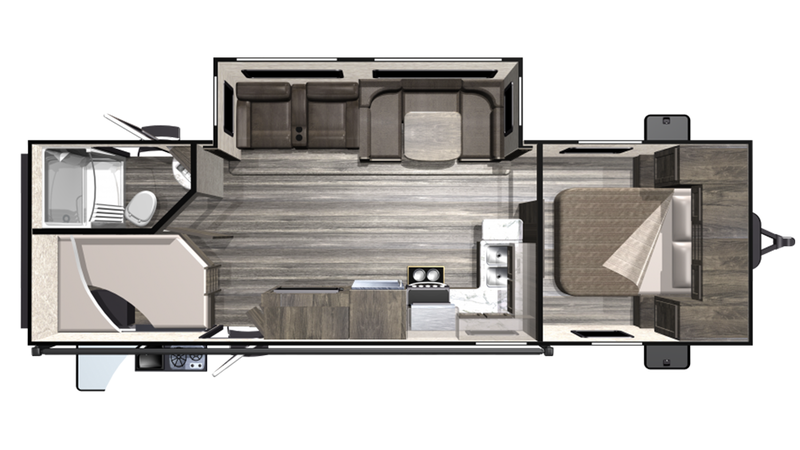 No makeshift sleeping quarters for you in the Mesa Ridge Lite MR2802BH! This RV sleeps 8 and comes with a spacious bedroom, handsomely furnished with storage for your clothes and sundries, and a regal Queen bed! You'll enjoy a multitude of options for breakfast, lunch, and dinner, thanks to the kitchen in this RV! It comes with all the modern appliances you need to cook delicious meals on the road, including a 3 burner range cooktop, 8.00 cu. ft. refrigerator, and more! With the 51 gallon freshwater tank, you can rest easy knowing that you'll have an abundance of water to clean, drink, shower, and cook with! Love a long, hot shower in the morning, but hate the trek to the damp, chilly, and often messy campground bathroom facility? You'll never go through that ordeal again, thanks to the beautiful, roomy bathroom with its shower, full sink vanity, and sanitary Porcelain Foot Flush commode! The 60 lbs. of LP tank capacity keep the water nice and hot, and dirty water and waste are stored in the 58 gallon gray water tank and the 29 gallon black water tank. After a full day of outdoor fun and an evening of games, everyone can settle down for a great night's sleep. You in the master bedroom, and your kids in the roomy bunkhouse with its Bunkbeds! The whole family will drift off to dreamland cozy and comfy! Food made outdoors always tastes great, and you'll enjoy making meals outside anytime you want thanks to the great outdoor kitchen!